Touch Flo 3D on HTC devices is pretty slick. 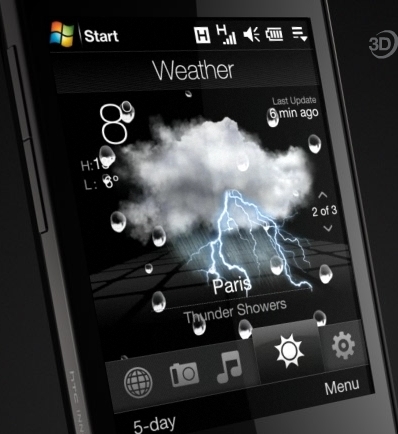 One of the things that really gets ooohhs and ahhhhs out of people when they first see it is animated weather screen. The weather screens shows rain drops hitting the screen when it’s raining (with a wiper that cleans the rain off), a shining sun, clouds, etc. It’s pretty fun to show off, but you can only show the weather for your current city at that time right? Nope. Turns out you can show off ALL the animations with a simply two touch combo and all the animations are displayed. Just tap the area to the left and then the right of where it says “Weather” in TouchFLO 3D and you’ll see all of the animations! Check out the video below to see how it works.